Wolves snapped up George Saville for the usual undisclosed fee. George came through the ranks with us after he joined from Reading aged just 11. He had a stint with Wolves boss Kenny Jackett at Millwall and a very successful loan to Brentford last season. The versatile midfielder also scores goals and will help Wolves with their promotion push. We wish him well. This week’s first draw pairs us with Bolton Wanderers at home in the league cup. It should be a chance for the likes of Lewis Baker and Andreas Christensen to get some experience but given Manchester United’s accident in Milton Keynes, Jose might err on the side of caution. A mixed bag out of Uefa’s plastic buckets – velvet bags are so much more sophisticated and old school – Schalke 04, Sporting Lisbon and NK Maribor. Schalke are familiar from last year, Jose should know all about Sporting Lisbon and Maribor were he party poopers at Celtic Park this week and champions of Slovenia. Maribor is the second city of what used to be a bit of Yugoslavia. It was the first former eastern block country to adopt the Euro and is useful to remember for quiz night. Fernando Torres is an AC Milan player on a two-year loan. Fernando didn’t reproduce his best goalscoring form for Chelsea but was a hard worker and contributed more assists than he did goals. In some way the £50m British record transfer label seemed to drag him down as successive managers struggled with the question of how to get the best out of him. The warmth from the stands for Fernando was always evident and he did help us to the European crown with the clinching goal in the semi-final. The deal has been structured as a two-year loan to avoid taking a heavy loss under financial fair play rules. We wish him well in Italy where we expect he will thrive without the level of, ahem, expectation. Fernando’s move does mean Chelsea will be back in the transfer market for a new striker. A new striker is more of a priority after Patrick Bamford moved on loan to Middlesbrough for the season. He joins Kenneth Omeruo up in smogland. Jose hated conceding three but even he couldn’t deny that this was the most entertaining game in ages. Diego Costa has only been here for three games and is already shaping up to be one of the best finishers we’ve ever had. From the kick off Cesc Fábregas slipped the ball down the side of the Everton defence for the Brazilian to thump home with only 34 second on the clock. 0-1. Tripe to Goodison are supposed to be nervous, tight and closely fought, so it was a surprise when a little more than a minute later Ramires slipped the ball through for Ivanovic to slide home. 0-2. Branislav was fortunate that a flag didn’t go up. A couple of minutes further on and Fábregas’s gorgeous ball through had Hazard racing clear only for Tim Howard to race forward and catch the ball outside his area. Clearly denying a goalscoring opportunity Howard should be off but referee and linesman both pretend nothing happened so we play on. Everton were struggling to get into the contest but Lukaku was busting to get an “I told you so” goal but managed just to thump the crossbar with a header as they started to find some form. Just before the break the excellent Kevin Mirallas rose highest to head the ball into the top left-hand corner beyond Courtois’ dive. 1-2. The goal and a half-time rollocking in Spanish gave Everton spring as they sought to build on their goal in the second period. They had possession but few chances and eventually frustrated they made the mistake of trying to rile Diego Costa. 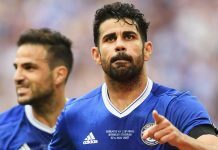 The outcome of the defenders tugging and prodding the Spain striker was a booking for Costa for shrugging in annoyance. It didn’t work. When Hazard drove into the box and fired the ball in off Coleman’s attempted block Costa found time to congratulate the defender on his own goal. Howard reacted angrily and leading with his head could have been sent off for the second time this afternoon. 1-3. They found a way back in immediately as we sleepily allowed McCarthy a free run and he set up Naismith to toe poke home. 2-3. Matic fired in from the edge of the area, 2-4, before substitute Samuel Eto’o came on to head another back to huge cheers. 3-4. We took it by the scruff from then on; Costa and Hazard zipped the ball around and Ramires strode through the lot to score a beauty. 3-5. Before Diego Costa crown a brilliant personal and team display by accepting a flicked back heel from Obi John to score past Howard. 3-6. Jose enjoyed the game despite the defending. Their goals were all really well taken and little blame can really be shared. Everton proved last season and against Arsenal that they are a threat to whomever they play. This was our first test and one we passed with colours flying. A resilient display will have pleased Joe Edwards most as a late Ike Ugbo goal secured the points. Loic Remy has signed on a four-year contract from QPR after we met the buy out clause in his contract said to be about £10m. The France international is a goalscorer of renown but has shuffled from club to club all around France to west London to Tyneside and back. It is to be hoped that he finds a solid, permanent home at the Bridge. Previous articleIs it a fond farewell for Fernando?